If you're on the hunt for a casual yet totaly chic ensemble, dress in a dark purple open cardigan and a tobacco blazer. Both items are totally comfy and will look amazing when paired together. Choose a pair of 1 STATE Nead Bootie to take things up a notch. If you're on the lookout for a casual yet totaly stylish look, wear a grey cardigan with grey sweatpants. Both items are very comfortable and look great together. Got bored with this getup? 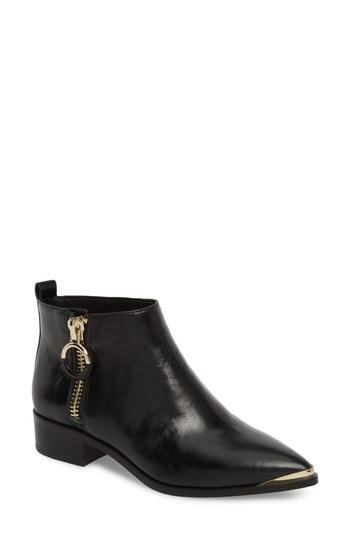 Enter black leather ankle boots to change things up a bit. If you're in search of a casual yet seriously stylish outfit, dress in a grey turtleneck and black leather overalls. As well as totally comfy, both pieces look fabulous when paired together. Got bored with this outfit? Enter 1 STATE black leather ankle boots to jazz things up. Try teaming a grey parka with a brown leopard mini skirt for a trendy and easy going look. To add oomph to your look, complete with 1 STATE Nead Bootie from Nordstrom. 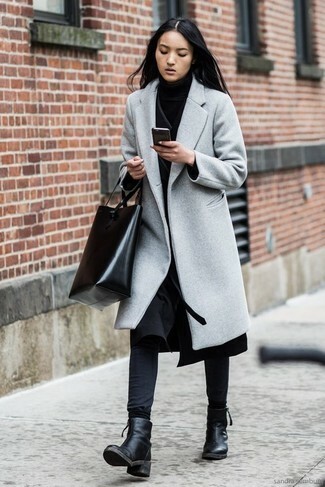 If you're on the hunt for a casual yet totaly stylish getup, rock a grey coat with black skinny jeans. Both of these pieces are totally comfortable and they will also look great when paired together. 1 STATE black leather ankle boots work spectacularly well with this getup. If you're in search of a casual yet incredibly chic look, go for a navy coat and black leather leggings. These two pieces are very comfy and they will also look stunning when paired together. Bump up the cool of your outfit by finishing off with 1 STATE Nead Bootie. If you're all about being comfortable when it comes to dressing up, this combination of a black oversized sweater and black skinny jeans is what you need. To add oomph to your ensemble, complement with 1 STATE black leather ankle boots. If it's comfort and functionality that you're searching for in an outfit, reach for a black midi dress. When it comes to footwear, this getup pairs wonderfully with 1 STATE Nead Bootie from Nordstrom. If you're after a casual yet seriously stylish getup, pair a black fur jacket with black skinny jeans. As well as very comfortable, both of these garments look great paired together. When it comes to footwear, this getup is round off nicely with 1 STATE Nead Bootie.